I decided to try and get one more unit painted before the year ends, but it looks like I will only get half of the squad done. I suppose I could count them as Inquisitional Guard, but that is not really in the spirit of things. Oh, this would be post number 100! So after a whirlwind trip to Boston followed by San Diego, I am back home and enjoying the last hours of 2009. 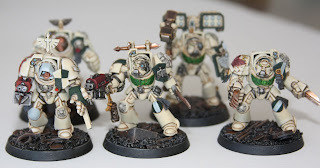 Since I do not have a black recipe for RW yet, I decided to give the regular green dark angels a try. DA green is surprisingly difficult. 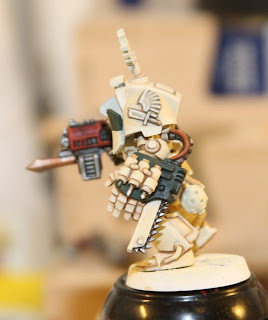 I am really glad I tried a single gunner rather than painting up the whole tac squad needed for my list. The gunners paint job is acceptable but not great. 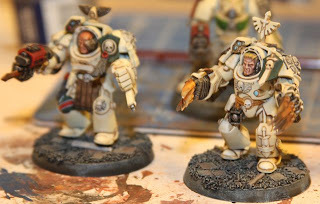 I really need a better recipe before I paint a whole squad. I noticed that I have 99 posts for the year if I include this one. Maybe I should paint up something else before midnight so I get a nice even 100 posts in! I had not planned to post again this year, since I am traveling and will not be home till the new year, but I could not resist one more. I figure a lot of people out there are speed building armies right now. Since I just sped through a bunch of basing, I thought I should share. This time around I went for a darker look. 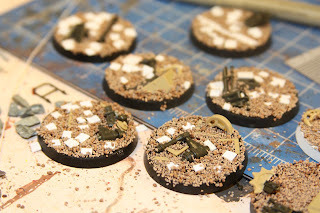 As usual I started with a bunch of sand, broken tank bits, and little squares of plastic cut with regular old scissors. 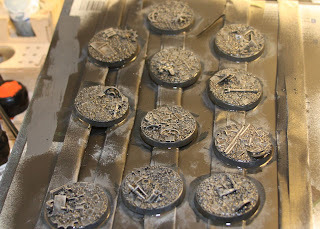 Once the glue had set I primed the bases black with a lot of primer. 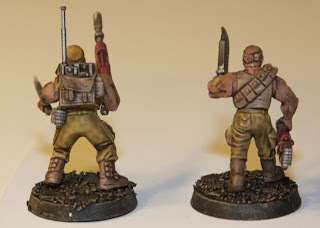 Don't skimp here because the paint helps the base stay together. 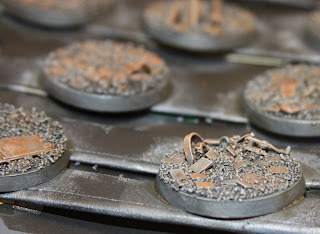 I then took a tank sized drybrush and mixed up some deheneb stone and chaos black to form a dirty grey color. I used this liberally over all of the bases, following up with a very heavy wash of devlan mud. The final part is my favorite technique right now. I use Tamiya Acrylic Thinner X-20A to make a very transparent blazing orange wash. Then just cover each ruined machinery bit and a few random spots with it. 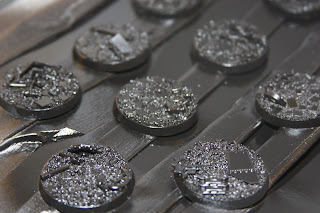 It is possible to knock out a whole army's worth of bases in an afternoon if you assembly line the process. I did steal my wife's hairdryer to speed the process along! Happy basing, and happy holidays! 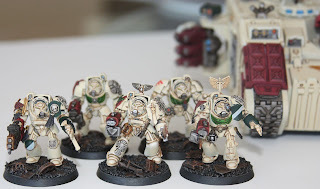 My deathwing fought their first battle this past weekend at the local GW, so I thought I should commemorate the event with a class photo! It was only a 1030 point game, but I had a really great time, and can't thank my opponent Bill enough. As some know, the east coast of the US was blanketed by snow this past weekend. 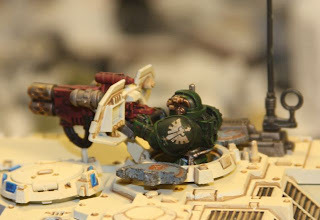 I faced a drop pod army captained by Lysander so I did not get to do much deep striking. 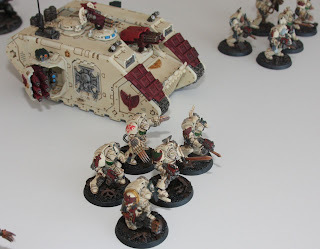 I've said ti before, but after that game I can't wait until I have raven wing painted up to join these guys in battle. I think the added maneuverability is going to be a lot of fun, freeing up my terminators to gather kill points. 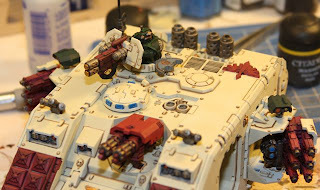 In terms of painting I have added a lot of little details to the land raider, which are probably visible in the photos. I tried to capture the color and the shading of these guys by using a white poster board to reflect natural light. This might me my last post this year, so happy holidays to everyone! It is snowing like crazy here on the east coast, so I spent the day being super productive hobby wise. 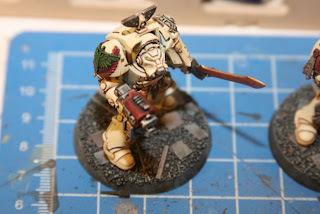 I started by making some snow bases for my space wolves. I think the jury is still out on the bases, but I will put up a stage by stage and recipe so others can see what I did. 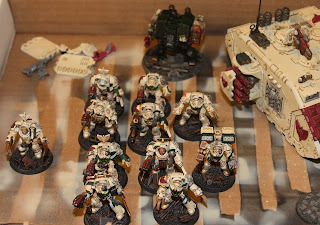 I then went back to my roots and built 11 deathwing ruined city bases. 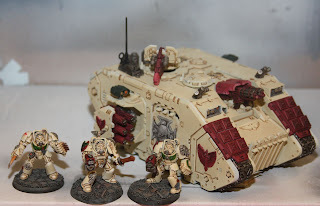 I made them a little darker, and added a lot of broken tank bits. I have the small PA troops + rhino, and then the Raven wing, which includes 1 master on land speeder, 1 regular speeder, 6 bikes, and one attack bike. I am not sure which order I will paint these in. I think the raven wing will come first just because I have never painted a SM bike! So now I want to game.....too bad there is a mountain of snow outside, and I have never driven my 10 ton rear wheel drive car in it before! 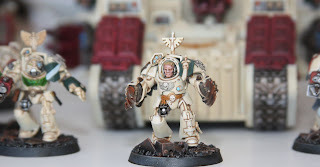 With these two guys done, I only have three more terminators to paint! 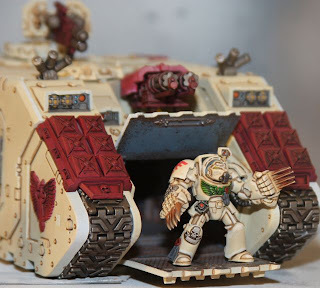 That will give me 2 squads, belial, and a land raider completed. I am really looking forward to getting all of this done so I can go back and add details at my leisure. 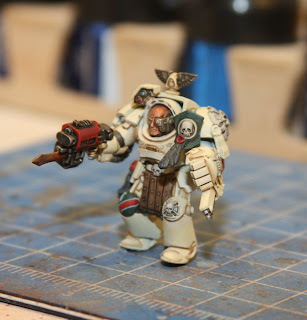 I have already practiced painting the apothecary symbol, so I think that will be my first embellishment post completion. I need to create 6 more bases, though I think I will do a new batch of 11 so they all match. 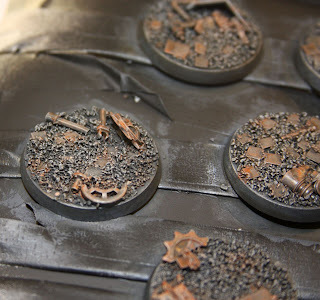 To tie the models in with their bases I am thinking about using some of the black forge world powder lightly dusted knee level down from each model. Has anyone tried this? I tried to make convincing blood gore using tamiya clear red paint, but it just does not look right to me. 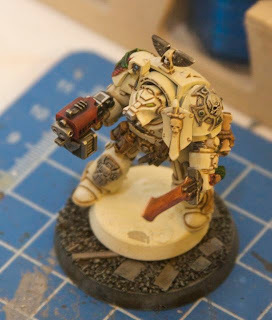 I have just finished Belial, the Captain of the Deathwing. Compared to some of the other terminators he is a little bland. I am considering painting his right leg green, and then adding a larger version of the red over green stripe heraldry as seen on the trooper to the left of him. 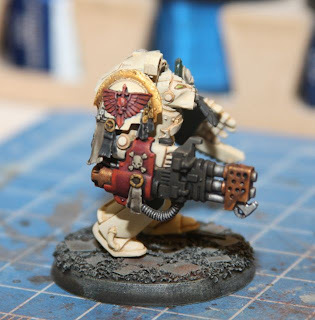 Overall I am very happy with how the deathwing is turning out, and am looking forward to the final 5 guys being don so I can just lavish details on them. 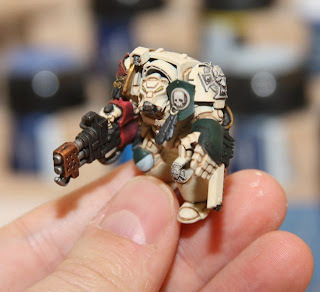 I am convinced that the black bases are the way to go since they provide the most contrast. Maybe I should raise Belial's base up a bit, or add more ruined detail. 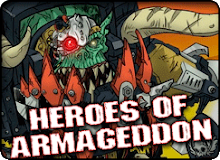 So far his only distinguishing characteristics are his chaos lord lightening claws. I have not even constructed the Ravenwing part of the force yet. My Imperial Guard army is not forgotten, even though I have loads of bikes and speeders to paint. I finally picked up a box of Catachans, so they will be represented in the force. I am really tempted to paint them up with orange jump suits and give them prison numbers. 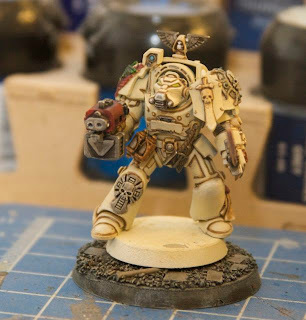 I wish I had produced a few more hooded deathwing models, since I really like the way this guy is turning out. 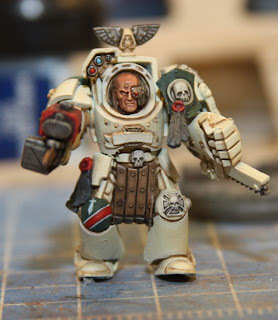 I know people complain all the time about terminators not wearing helmets, but I really like the character that can be head by painting an actual face. It gives the terminator a sense of scale that is really cool. 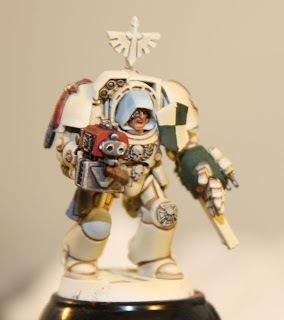 The model still needs to have some cleanup, as well as censor ball, lenses and heraldry. 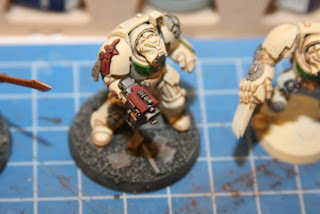 I am not sure if I should paint the vials on the chainfist or just leave them bone colored. This guy represents 5 out of 11, so I am almost at the half way mark! 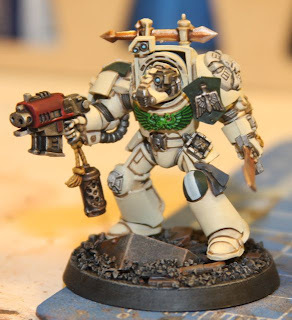 I just finished an AOBR terminator painted up as part of my deathwing, which gives me 4 out of the 11 I am painting. I was not as patient with this guy, which stands out to me, but I am pleased with how he turned out. I tried to paint a little heraldry the knee pad. What is clear to me from attempting it is that I need to buy new brushes. One of the things that was better than expected.... 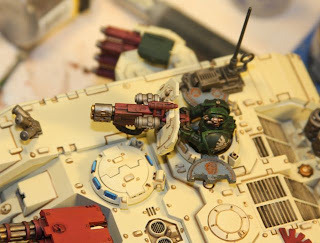 The red dark angel transfer on the lightening claws guy. I used micro-set and micro-sol, and am really happy with how it turned out. 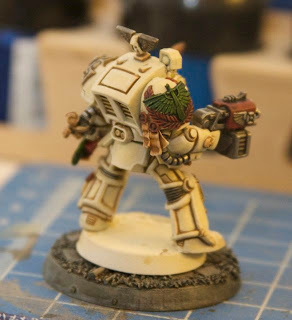 I almost wish I had another bare shoulder pad so I could use another transfer on another guy. 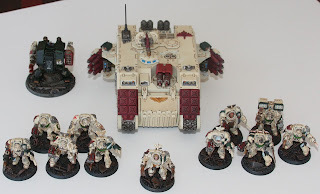 I am churning through deathwing at the moment. 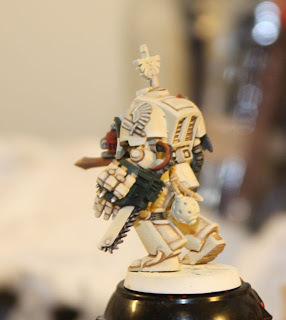 Now that I know not to put red and green so closely together on the miniatures I think things are working out. These are really getting an old school clean look to them that I like one moment, and then am irritated by the second. 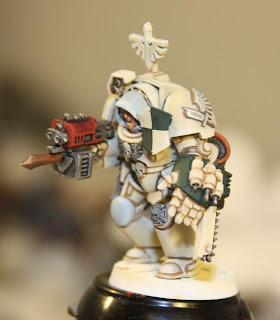 I think I have just gotten used to the idea of mud covered guardsmen that cleanish armor looks weird. The photos do not capture the shading very well, but the I think you get the idea. 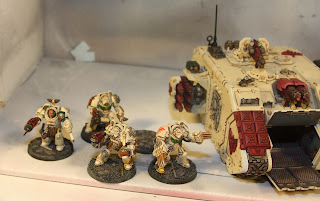 I met a couple of cool guys named rob at the GW store who were interested in some narrative wargaming, so these DA are being painted up for some hard hitting variety. 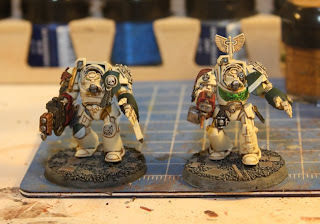 The lightning claw guy on the right shows off the inking done with graveyard earth and paint thinner. 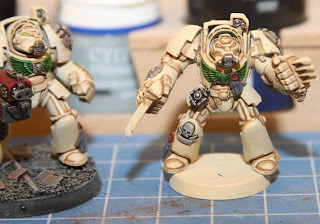 Once it is dry I paint all of the details, and then go back and clean up the armor. 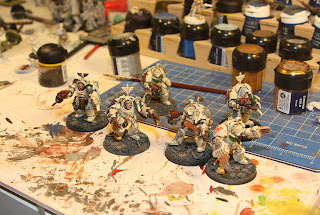 Now on to basing..would it be weird to base these guys differently than the raven wing they will be supporting? 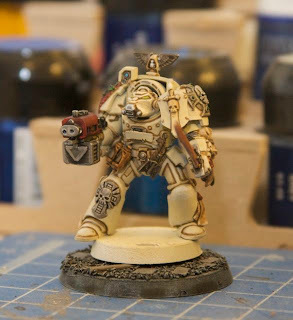 I finished my first deathwing terminator! 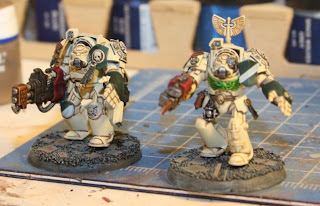 I think I may go with a dark brown dried earth for my basing, since that would work well with the raven wing that go along with these guys. The red and the green look a bit christmassy to me, but so be it. 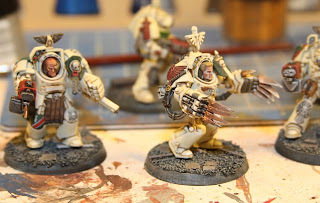 I want these guys to be pure bone white angels of death. The fact that they have a bit of holiday spirit should not detract. While painting this guy I learned an invaluable lesson. Do not finish the armor first. 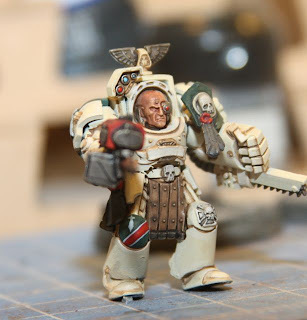 I know it seems weird, but I made so many mistakes while painting the little bits on this guy that I ended up having to go back and cover up brush strokes that accidentally hit the blended armor. So one is done. If I were to assembly line it I think I could have these done by Sunday, but I think I need to slow down and think about some heraldry for a few of the guys. Now that the whole native americas in space background is gone, I think I will focus on medieval heraldry for the guys with knee pads.